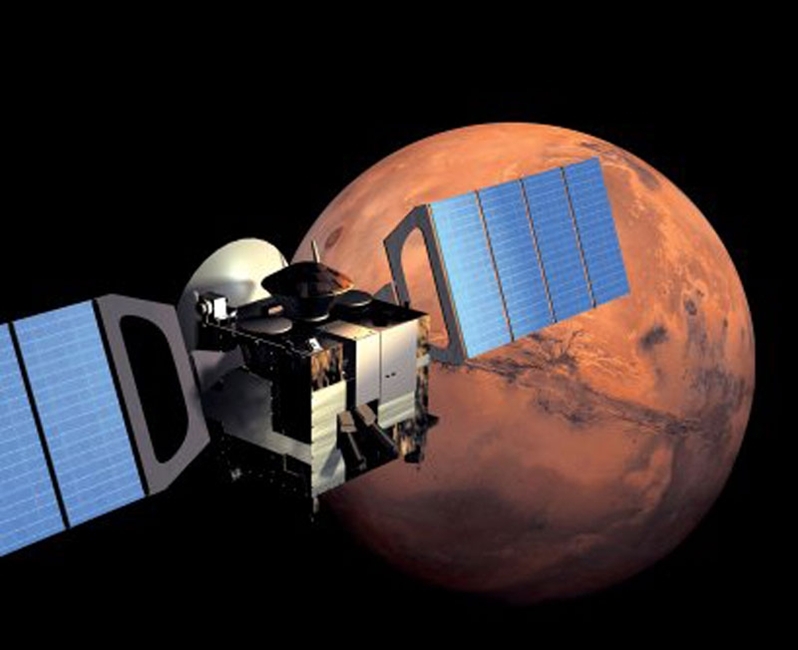 Mars Express is one of numerous spacecraft to have visited the Red Planet. Scientists see this discovery as having major implications for understanding the water cycle and the historical evolution of the atmosphere. New analysis of data sent back by the SPICAM spectrometer on board the European Space Agency’s (ESA) Mars Express spacecraft revealed that the planet’s atmosphere is supersaturated with water vapor. This surprising discovery has major implications for understanding the martian water cycle and the historical evolution of the atmosphere. Although numerous spacecraft have visited Mars over the past half-century, few direct measurements of the vertical structure of the planet’s atmosphere have been made. Since most of the spacecraft instruments have looked down at the surface, it has only been possible to infer the horizontal distribution of gases in the atmosphere, leaving the question of how water vapor is being mixed into the atmosphere almost unexplored. This lack of direct measurements has meant that descriptions of the vertical distribution of water vapor — a key factor in the study of Mars’ hydrological cycle — has generally been based upon global climate models. This gap in the data has now been addressed by the Spectroscopy for Investigation of Characteristics of the Atmosphere of Mars (SPICAM) imaging spectrometer on Mars Express. The instrument can be used in occultation mode when it studies light from the Sun that has passed through the planet’s atmosphere just after sunrise or before sunset. The measurements can then be analyzed to generate vertical concentration profiles for several atmospheric constituents, including water vapor. Surprising new results, based on SPICAM data obtained during the northern spring and summer, indicate that the vertical distribution of water vapor in the martian atmosphere is different from previous assumptions. The atmosphere of Mars holds 10,000 times less water vapor than that of Earth. However, water vapor is a very dynamic trace gas, and one of the most seasonally variable atmospheric constituents on Mars. Under normal conditions on Earth, water vapor condenses around tiny dust or aerosol particles or salts when the atmospheric temperature drops below a certain dew point. When the atmosphere cannot hold any more moisture at a specific temperature and pressure, the atmosphere is “saturated.” Any water vapor in excess of the dew point will normally condense to form droplets or icy crystals. However, super-saturation may occur when some of the water vapor remains in the atmosphere instead of condensing or freezing. When condensation nuclei — assumed to be dust aerosols on Mars — are too rare, condensation is impeded, leaving substantial amounts of excess vapor. Until now, it was generally assumed that such super-saturation couldn’t exist in the cold martian atmosphere. Any water vapor in excess of saturation was expected to be converted immediately into ice. However, the SPICAM data revealed that super-saturation occurs frequently in the middle atmosphere — at altitudes of up to 30 miles (50 kilometers) above the surface — during the aphelion season, the period when Mars is near its farthest point from the Sun. Extremely high levels of super-saturation were found on Mars, up to 10 times greater than those found on Earth. Clearly, there is much more water vapor in the upper martian atmosphere than anyone ever imagined. It seems that previous models greatly underestimated the quantities of water vapor at heights of 10 to 30 miles (20 to 50 km), with as much as 10 to 100 times more water than expected at this altitude. “The data suggest that much more water vapor is being carried high enough in the atmosphere to be affected by photo dissociation,” said Franck Montmessin, also from LATMOS. The new paper analyzes SPICAM data obtained when the martian atmosphere is relatively dust-free. The absence of dust enables the instrument to measure the vertical profile to within 6 miles (10 km) of the planet’s surface. The super-saturation levels are likely to plummet in the southern summer, when dust storms inject large amounts of aerosols into the atmosphere, increasing the supply of condensation nuclei.